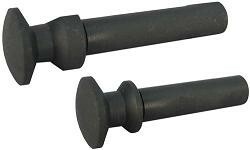 These takedown pins have over sized heads to make separating the upper and lower receiver faster and easier. Perfect for the shooting enthusiast with a variety of top ends and a single lower receiver. Heat treated and plated to Mil. Specs.